Today, the journal Nature Astronomy will publish the article The delay of shock breakout due to circumstellar material evident in most Type II Supernovae [science paper not made available even in a search], written by a group of researchers from the Center for Mathematical Modeling (CMM) and the Department of Astronomy of the University of Chile, Millennium Institute of Astrophysics (MAS) and international institutions, after four years of work. 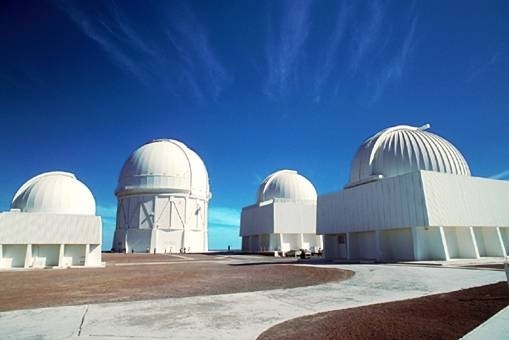 The discovery was made at the Cerro Tololo Inter-American Observatory – which is part of the AURA Observatory in Chile, funded by the National Science Foundation of the United States – by scanning the sky using DECam for 14 nights at the 4-m Victor Blanco Telescope, and they will change what is known about supernova explosions and the last stages of stellar evolution. In particular, the group discovered that supernovae generated from red supergiants, stars of great size in advanced stages of their lives, present a flash before the main explosion not predicted by current models. The discovery was made possible because the explosions were observed in real time in their initial stages. To do this, data analysis techniques developed in Chile unprecedented for Astronomy, machine learning, astrophysical models created in Japan and high performance computing were used. Monster black holes sometimes lurk behind gas and dust, hiding from the gaze of most telescopes. But they give themselves away when material they feed on emits high-energy X-rays that NASA’s NuSTAR (Nuclear Spectroscopic Telescope Array) mission can detect. That’s how NuSTAR recently identified two gas-enshrouded supermassive black holes, located at the centers of nearby galaxies. Both of these black holes are the central engines of what astronomers call “active galactic nuclei,” a class of extremely bright objects that includes quasars and blazars. Depending on how these galactic nuclei are oriented and what sort of material surrounds them, they appear very different when examined with telescopes. Active galactic nuclei are so bright because particles in the regions around the black hole get very hot and emit radiation across the full electromagnetic spectrum — from low-energy radio waves to high-energy X-rays. However, most active nuclei are believed to be surrounded by a doughnut-shaped region of thick gas and dust that obscures the central regions from certain lines of sight. Both of the active galactic nuclei that NuSTAR recently studied appear to be oriented such that astronomers view them edge-on. That means that instead of seeing the bright central regions, our telescopes primarily see the reflected X-rays from the doughnut-shaped obscuring material. “Just as we can’t see the sun on a cloudy day, we can’t directly see how bright these active galactic nuclei really are because of all of the gas and dust surrounding the central engine,” said Peter Boorman, a graduate student at the University of Southampton in the United Kingdom. Boorman led the study of an active galaxy called IC 3639, which is 170 million light years away. This galaxy contains an example of a supermassive black hole hidden by gas and dust. Researchers analyzed NuSTAR data from this object and compared them with previous observations from NASA’s Chandra X-Ray Observatory and the Japanese-led Suzaku satellite. The findings from NuSTAR, which is more sensitive to higher energy X-rays than these observatories, confirm the nature of IC 3639 as an active galactic nucleus that is heavily obscured, and intrinsically much brighter than observed. Researchers analyzed NuSTAR data from this object and compared them with previous observations from NASA’s Chandra X-Ray Observatory and the Japan-led Suzaku satellite. NuSTAR also provided the first precise measurement of how much material is obscuring the central engine of IC 3639, allowing researchers to determine how luminous this hidden monster really is. More surprising is the spiral galaxy that Annuar focused on: NGC 1448. 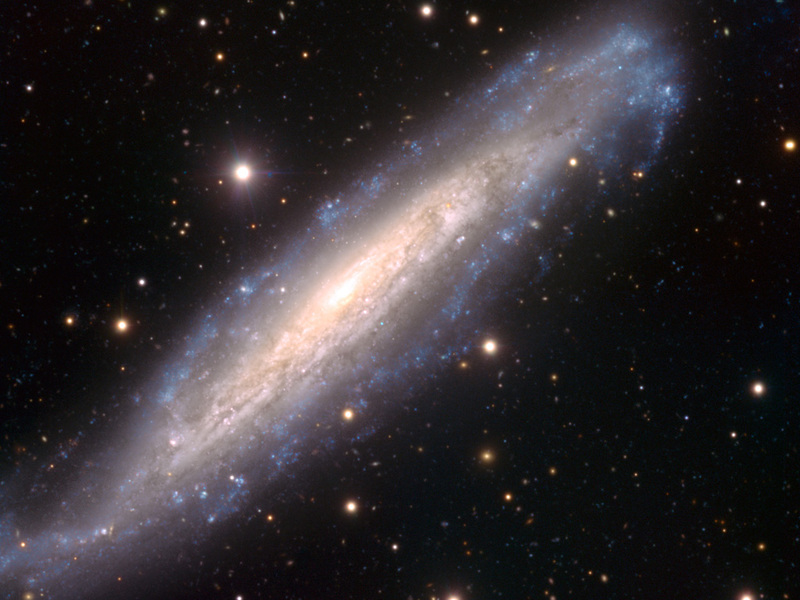 NGC 1448 (also designated NGC 1457 and ESO 249-16) is a spiral galaxy located about 60 million light-years away in the constellation Horologium. It has a prominent disk of young and very bright stars surrounding its small, shining core. The galaxy is receding from us with 1168 kilometers per second. NGC 1448 has recently been a prolific factory of supernovae, the dramatic explosions that mark the death of stars: after a first one observed in this galaxy in 1983 (SN 1983S), two more have been discovered during the past decade. Visible as a red dot inside the disc, in the upper right part of the image, is the supernova observed in 2003 (Type II supernova SN 2003hn), whereas another one, detected in 2001 (Type Ia supernova SN 2001el), can be noticed as a tiny blue dot in the central part of the image, just below the galaxy’s core. If captured at the peak of the explosion, a supernova might be as bright as the whole galaxy that hosts it. A Type Ia supernova is a result from the violent explosion of a white dwarf star. This category of supernovae produces consistent peak luminosity. The stability of this luminosity allows these supernovae to be used as standard candles to measure the distance to their host galaxies because the visual magnitude of the supernovae depends primarily on the distance. A Type II supernova results from the rapid collapse and violent explosion of a massive star. A star must have at least 8 times, and no more than 40–50 times the mass of the Sun for this type of explosion. It is distinguished from other types of supernova by the presence of hydrogen in its spectrum. Type II supernovae are mainly observed in the spiral arms of galaxies and in H II regions, but not in elliptical galaxies. This image was obtained using the 8.2-metre telescopes of ESO’s Very Large Telescope. It combines exposures taken between July 2002 and the end of November 2003. The black hole in its center was only discovered in 2009, even though it is at the center of one of the nearest large galaxies to our Milky Way. By “near,” astronomers mean NGC 1448 is only 38 million light years away (one light year is about 6 trillion miles). Annuar’s study discovered that this galaxy also has a thick column of gas hiding the central black hole, which could be part of a doughnut-shaped region. 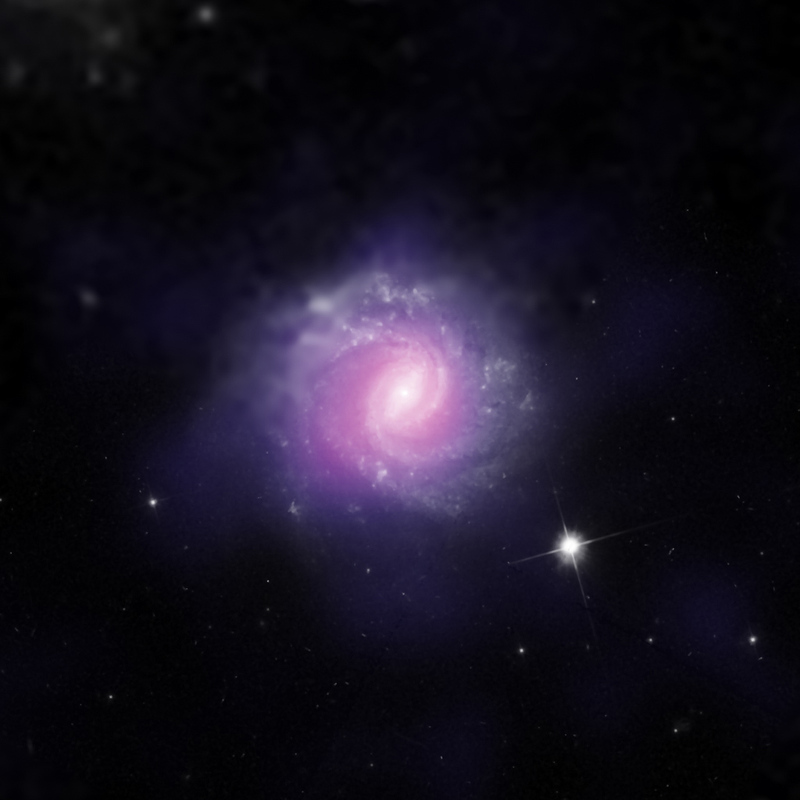 X-ray emission from NGC 1448, as seen by NuSTAR and Chandra, suggests for the first time that, as with IC 3639, there must be a thick layer of gas and dust hiding the active black hole in this galaxy from our line of sight. Researchers also found that NGC 1448 has a large population of young (just 5 million year old) stars, suggesting that the galaxy produces new stars at the same time that its black hole feeds on gas and dust. Researchers used the European Southern Observatory New Technology Telescope to image NGC 1448 at optical wavelengths, and identified where exactly in the galaxy the black hole should be. A black hole’s location can be hard to pinpoint because the centers of galaxies are crowded with stars. Large optical and radio telescopes can help detect light from around black holes so that astronomers can find their location and piece together the story of their growth. “It is exciting to use the power of NuSTAR to get important, unique information on these beasts, even in our cosmic backyard where they can be studied in detail,” said Daniel Stern, NuSTAR project scientist at NASA’s Jet Propulsion Laboratory, Pasadena, California. NuSTAR is a Small Explorer mission led by Caltech and managed by JPL for NASA’s Science Mission Directorate in Washington. NuSTAR was developed in partnership with the Danish Technical University and the Italian Space Agency (ASI). The spacecraft was built by Orbital Sciences Corp., Dulles, Virginia. 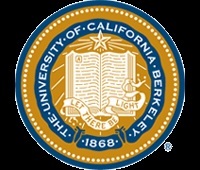 NuSTAR’s mission operations center is at UC Berkeley, and the official data archive is at NASA’s High Energy Astrophysics Science Archive Research Center. ASI provides the mission’s ground station and a mirror archive. JPL is managed by Caltech for NASA.